Airbnb hosts are supposed to be smallholders: people who rent out a spare room or let out their homes while they're out of town -- but in New York (and other cities), the system is dominated by professional landlords who have illegally converted huge swathes of the city's available housing stock into unlicensed, highly profitable hotel rooms. Because supply and demand is a thing, removing available stock from the rental market has made rents go up and contributed to the housing bubble (because a private home that can be rented on Airbnb can be turned into a very profitable asset relative to a traditional long-term rental-based income property, bidders who intend to remove the home from the supply of housing stock are willing to pay more for the same house than people who just need a place to live). In The High Cost of Short-Term Rentals in New York City, a group of academics from McGill's School of Urban Planning analyze data scraped from Airbnb's site to quantify the effect of Airbnb rentals on the already drastically undersupplied NYC housing market. 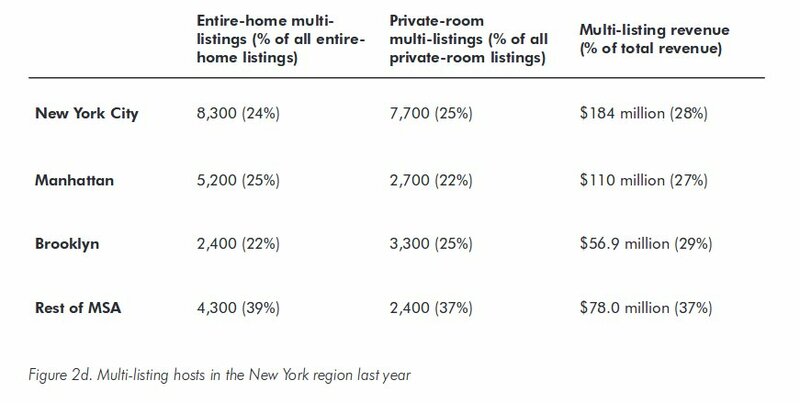 They analyzed 80,000,000 datapoints spanning 2014-2017 and conclude that 28% of the revenue for NYC Airbnbs goes to commercial operators, who use predatory pricing to force out the smallholders and spare-room-renters who are supposed to be the backbone of Airbnb; 42-46% of the listings from these commercial hosts are illegal under New York's Multiple Dwelling Law. Especially hard-hit are neighborhoods where racialized people live; these are particularly profitable places for commercial landlords to convert whole homes to Airbnbs. Black neighborhoods are six times more likely to have their housing converted to hotel rooms than white neighborhoods. The research was partly funded by the hotel lobby, who have a vested interest in banning Airbnb.